Should we be concerned about the Trans-Pacific Partnership Agreement (TPPA)? Click link for news. At a time of profound change, we are concerned that this agreement will slow the steps we need to take as communities and as a nation in the light of reducing CO2 output, limiting waste, and slowing consumption. Negotiated in secret, with minimal consultation with tangata whenua or the public, many commentators are concerned that this agreement will create a mega-treaty across nine or more countries putting a straightjacket on the policies and laws our government can adopt for the next century and give massive new powers to corporations. Interestingly, the one thing US Presidential hopefuls Sanders, Clinton and Trump agree on is that the TPP is a bad idea!! Started by mark skelding in Uncategorized. Last reply by Grant N Platt Oct 14, 2018. Started by Grant N Platt in FOOD. Last reply by Grant N Platt Oct 14, 2018. Started by Odee Rose in Uncategorized Jul 13, 2016. Started by Odee Rose in Uncategorized. Last reply by Odee Rose Jun 27, 2016. 2016 - Conversation is Back!! Seems we really are the one's we've been waiting for. Started by mark skelding in Uncategorized Apr 17, 2016. T3: Transition Town Thames:the future is local.....................We are the one's we've been waiting for. 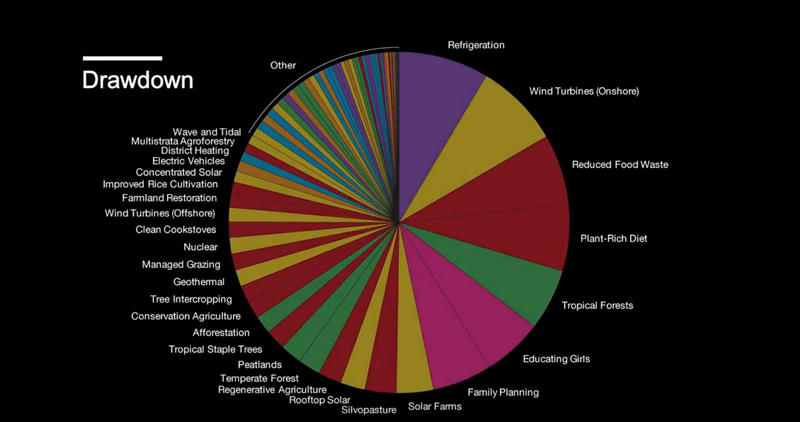 When we think about solutions to global warming our most likely responses are – “electric cars, more efficient light bulbs, public transport, solar and wind power and eating less meat”. While these are all very worthwhile options, – do they stack up as the most effective measures and top priorities? Actually many don’t. And who would have guessed that refrigerant management would be No 1? https://teggtalk.files.wordpress.com/2017/07/book.png?w=117&h=150 117w, https://teggtalk.files.wordpress.com/2017/07/book.png 463w" sizes="(max-width: 234px) 100vw, 234px" />Until now no one has seriously researched and ranked all of the various possible solutions. 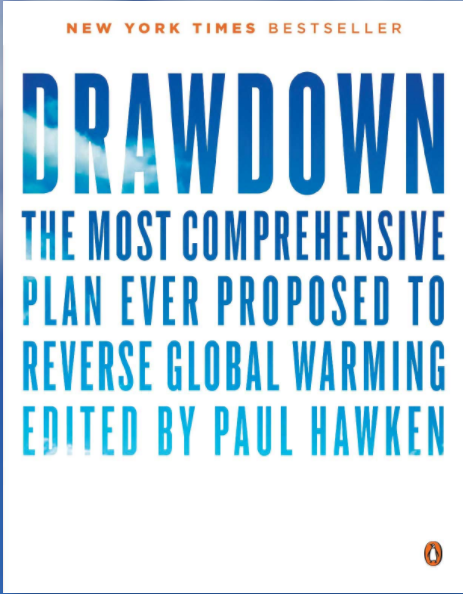 Now a new book – “Drawdown: The Most Comprehensive Plan Ever Proposed to Reverse Global Warming” (Penguin Books), has been published by Paul Hawken along with a large team of research fellows, writers and advisors. The Drawdown book contains 80 solutions — “techniques and practices” — that are ready today, and that collectively can draw down atmospheric concentrations of greenhouse gases. Many, if not most, of these solutions can be undertaken with little or no new laws or policy and can be financed profitably by companies and capital markets. To qualify for inclusion, a solution must have proven to reduce energy use through efficiency, material reduction or resource productivity; replace existing energy sources with renewable energy; or sequester carbon in soils, plants or kelp through regenerative farming, grazing, ocean and forest practices. Each solution is ranked by cost-effectiveness, speed to implementation and societal benefit. Also included is the projected savings in greenhouse gas emissions by 2050, and the solution’s total financial cost — the amount of money needed to purchase, install and operate it over 30 years — and its net cost or benefit — how much money would be required to implement the solution compared to the cost of repeating business as usual. Drawdown’s aggregate bottom line is shockingly affordable: When you total up the net first costs and subtract the net operating costs for all 80 solutions, the net operating savings add up to $74 trillion over 30 years. 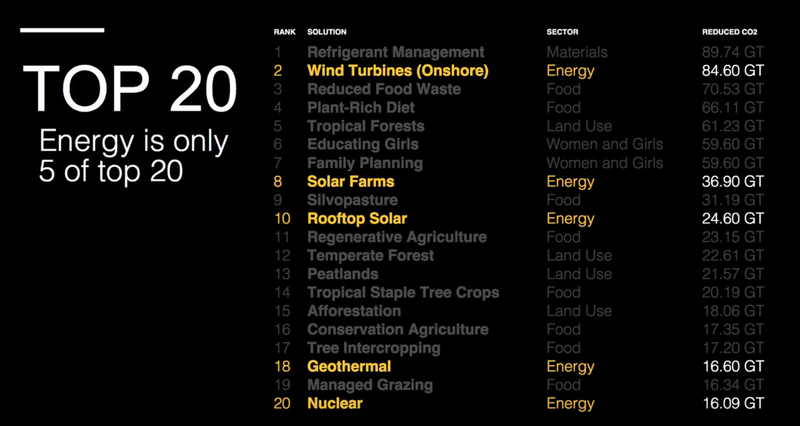 It will surprise many – it did me – that energy solutions like solar, wind, nuclear, and geothermal are only 5 of the top 20 solutions. How many of us would have considered that refrigerant management would be the number one solution? Over 30 years Drawdown calculates that 87 percent of refrigerants can be contained, avoiding emissions equivalent to 89.7 gigatons of carbon dioxide. Another surprising conclusion related to Women’s work. If women smallholders get equal rights to land and resources, they will grow more food, feed their families better throughout the year and gain more household income. When women earn more, they reinvest 90 percent of the money they make into education, health and nutrition for their families and communities, compared to 30 to 40 percent for men. Educating girls is yet another promising solution, because education correlates to higher wages and greater upward mobility, contributing to economic growth. When girls attend school, their rates of maternal mortality drop, as do mortality rates of their babies. Their agricultural plots are more productive and their families better nourished. All of which leads to reduced climate impacts. When you add up these solutions — educating girls is No. 6 and family planning is No. 7 — empowering girls and women for addressing global warming represents the most impactful tool for achieving drawdown. There are many other confounding conclusions in Drawdown. But what struck me as the most positive takeout is that there are many highly effective practices which we as individuals can adopt in our day to day lives, such as eating a more plant based diet and cutting down on food waste – to name a few. Are Coromandel Frogs Croaking Due To Global Warming? Mark Skelding is the convenor. John Leenman is the treasurer. The society maintains this T3Connect website as a free, social media site for community connection, event sharing and ideas generation. Anyone can join Transition Town Thames Inc - its a $5 membership fee - and/or be part of a core group of folk who meet - often over breakfast - to consider projects and initiatives relevant to our purpose. To get more involved, please contact Mark on 868 3220, or anyone who looks like they might have an idea who's on the core group..... often called "the usual suspects"!